A new calendar year brings with it the start of tax season. Filing your taxes can be challenging and stressful, especially if you're new to filing taxes or if you had major life changes in the prior year, like getting married, having a baby, starting college, or moving for a new job. Following these five simple steps can help you stay organized and reduce your stress during this tax season. If you are an independent adult who earned over $12,001 in 2018, you will be required to file a federal tax return. Be aware that even if you are not required to file a federal return based on your earnings, you may need to file a state or local tax return based on where you live. The federal tax filing deadline for 2019 is Monday, April 15. You must file by that date to avoid any penalties or fines. Sometimes major crisis events happen that make it challenging or impossible to file your taxes by the deadline. You can submit a request for a deadline extension through the IRS; however, if you owe federal taxes, you will still need to pay the amount owed by the April 15 deadline or you may face fees and penalties for late payment of taxes. You'll also need to know your Social Security number, as well as the Social Security numbers of any dependents you claim, as well as the routing number of your bank if you'd like to receive your refund electronically by direct deposit. The paperwork required for filing your taxes can seem overwhelming. Quick tip: create a file folder where you can keep all of your tax statements that come by mail and by email in one place until you have everything you need to file your taxes. W-2 statements from employers detailing your earnings and taxes paid through the year. 1099 statements if you worked as an independent contractor or did freelance gigs for a company. Earnings that you tracked from any other side jobs where you earned less than $600. This could be copies of checks or deposits received. 1095 Healthcare statements regarding your health insurance. 1098 Student Loan Interest statements if you're still paying off student loans. 1098 Mortgage Interest statements if you are paying a home mortgage. Medical bills and expenses, including hospital bills, doctor bills, and prescriptions. Business and professional expenses, such as professional fees, continuing education fees, and conferences. Charitable giving receipts, including cash donations as well as donations for goods or services. There are a number of tax credits and tax rebates available through the federal government. 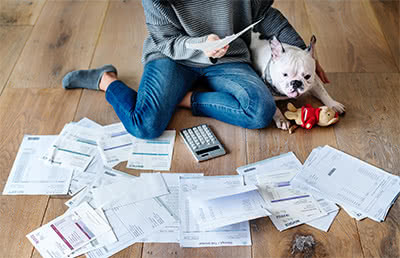 Some of the more common ones include the Child Tax Credit, Child and Dependent Care Credit, Student Loan Interest Deduction, Tuition Fee Deduction, Lifetime Learning Credit, Mortgage Interest Deduction, and Home Office Deduction to name a few. If you opt to use one of the major online tax filing websites, you will be prompted through a series of questions to determine if you are eligible for different rebates and credits. Once you have all of your information and documents gathered in one place, it's time to file your taxes. You can opt to use one of the online filing services such as TurboTax or H&R Block, both of which offer free filing options for simplified federal tax returns and paid options for more complex federal filing or combining your federal and state filings. You can also file your taxes directly through IRS.gov. If you discover you owe federal taxes, you will need to pay those when you file. If you are filing online through one of the major tax preparation websites such as H&R Block or TurboTax, you will be offered a link to pay the government what you owe when you're filing online. If you're preparing and filing your taxes yourself, you can directly pay the IRS online. Once you've filed, you can use the Where's My Refund? tool online at the IRS to check the status of your refund and when to expect your direct deposit from the IRS. Filing your taxes is an important annual task that helps keep your financial life in order. Following these simple steps as well as creating a paperwork organization system that works for you will help make this job easier, both this year and in years to come.